Following Spirited Away, Miyazaki Hayao didn't immediately start upon another feature film. 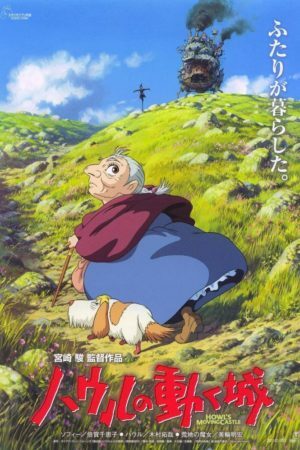 Between 2001 and 2006, he directed a cluster of short films meant exclusively for the Ghibli Museum just outside of Tokyo; shockingly, that exclusivity seems to have held firm, even in this day of widespread internet piracy, and despite my best efforts, I haven't been able to find a trace of any of them. Sadly, my blogging travel budget for 2010 has been all used up, so I wasn't able to make it out to Mitaka, Japan in time for this series. Part of me is impressed that Miyazaki and company were able to keep those shorts so protected, although it's equally disappointing that I can pull up, within 30 seconds, images of acts so depraved that even describing them would cause my keyboard to go up in flames, but not what I am certain are tiny little masterpieces by one of Japan's most prominent filmmakers. It's probably all for the best, though. One of the films in questions is a spin-off of My Neighbor Totoro, titled Mei and the Kitten Bus, and I rather imagine that the resultant cuteness would be so overwhelming that it would kill me before I could review it. 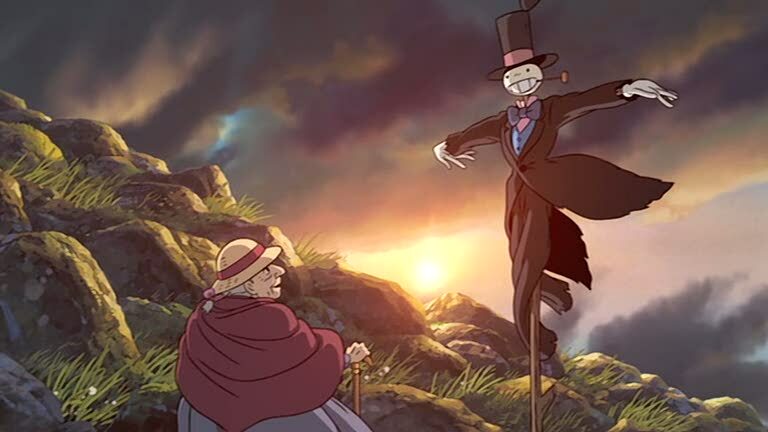 At any rate, we must therefore skip ahead to 2004, when the director released his first Ghibli-era film adapted from a non-Japanese source: Howl's Moving Castle, based on the novel by Diana Wynne Jones. Though initially, this wasn't to have been a Miyazaki film at all; when the project was initiated in 2001, it was under director Hosoda Mamoru, who was around that time directing the popular Digimon series for Toei Animation. This would have been a new break for Ghibli, which had to this point only released films directed by Miyazaki, Takahata Isao, or someone raised up from the ranks. I cannot say why the Ghibli leaders decided initially to make this decision, but in the event it didn't matter; they didn't find that Hosoda's approach to the material was a good fit, and he quit. After a few months watching the film bob about aimlessly, Miyazaki took it over, much as he'd done 15 years earlier when Kiki's Delivery Service had gotten stalled out. Kiki and Howl are quite a pair, actually: besides both of them being projects that Miyazaki took over when they were foundering in development, they're both adaptations of children's novels (all of Miyazaki's other Ghibli films were from his own scenarios), and if I can be so bold, they're his only two major films that strike me as having too much running time for the stories they're telling, and they're the least-engaging. With Princess Mononoke, a film I have a hard time loving outright, I at least understand what drove the filmmaker: it is both passionate and urgent. 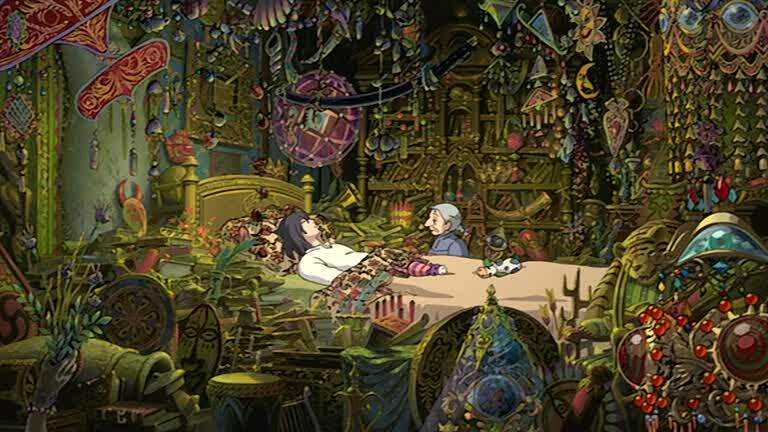 With Howl's Moving Castle, though it's perfectly imaginative and entertaining, I don't see the same singularity of purpose: it's a handsome fantasy movie with only a nod in the direction of the rich, all-encompassing humanity and emotionality of Miyazaki's greatest work. 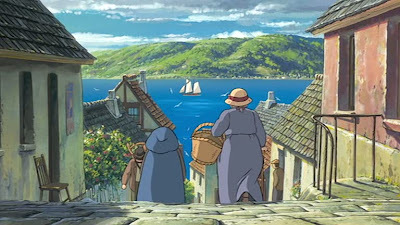 It's the third film in Miyazaki's filmography, after Princess Mononoke and Nausicaä of the Valley of the Wind, to open with a shot of a foggy landscape (the second, after Nausicaä, to show something mysterious emerging from that fog), and the effect is generally the same in all three cases: it suggests a vast world of unexplored possibilities, and it's the very fact that you can't make anything out very clearly that creates that feeling. And, of course, fog is pretty. 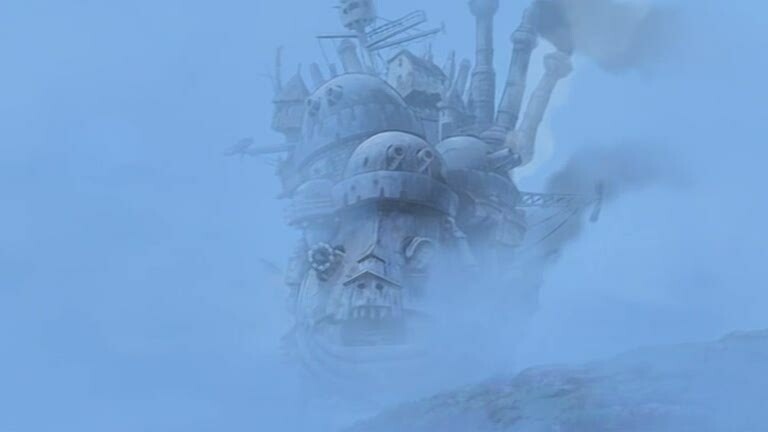 Of course, the opening shot of this film gets extra points, because the half-glimpsed Thing that emerges from the mist, looking something like a mechanical skull at first, is a marvelous and mysterious piece of design and animation altogether; hiding it behind a barrier of fog is nothing more or less than Miyazaki's way of teasing us before he gives us the whole reveal. Howl's moving castle - for this is what that Thing turns out to be - is among the creative peaks of Miyazaki's canon, and probably the peak of his use of CGI - if Monokoke and Spirited Away would have lost something for being made without computers, Howl's Moving Castle would have been unrecognisably different. Since that first shot, by intent, doesn't show very much of it, I'll give you another still. But even that's not quite all the way there: to really get the full impact, you need to see the castle moving. It's a pretty awe-inspiring bit of animation. 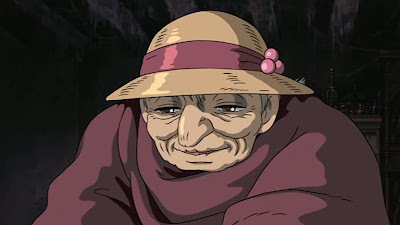 Incidentally, since I'll likely not have a better chance to mention, the film's art directors were Takeshige Yôji and Yoshida Noboru, and all the digital animation was directed by Katâma Mitsunori, so presumably those three had a healthy amount of influence in how the moving castle was achieved. Whoever did it, it looks outstanding. I'll have more to say about the film's look, but for now, the story. 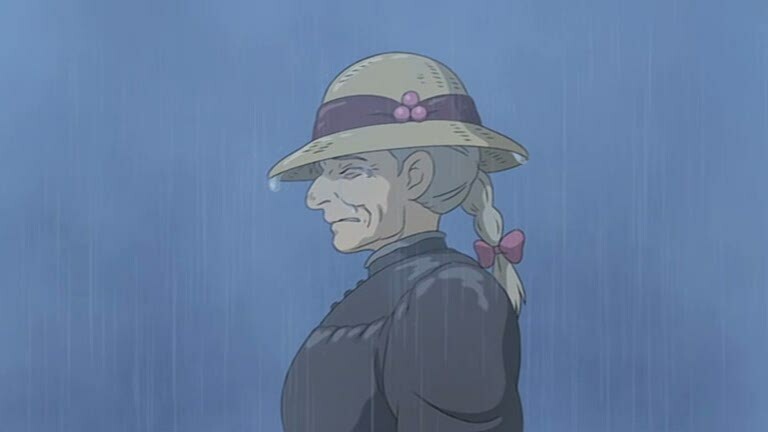 The somewhat convoluted narrative of Howl's Moving Castle begins with a sensible young lady named Sophie (Baisho Chieko), who has taken over her late father's hat shop, and how she runs afoul of a pair of lusty soldiers looking for a quick lay one afternoon (not that the phrase "a quick lay" is present in what is still mostly a children's movie). She's rescued from their advances by a strange man (Kimura Takuya) with blond hair, dressed in a flashy coat, but his appearance heralds the arrival of blobby, half-formed human monsters, and the man takes Sophie flying through the air to escape them - she isn't sure yet, but Sophie suspects that this is the wizard Howl. 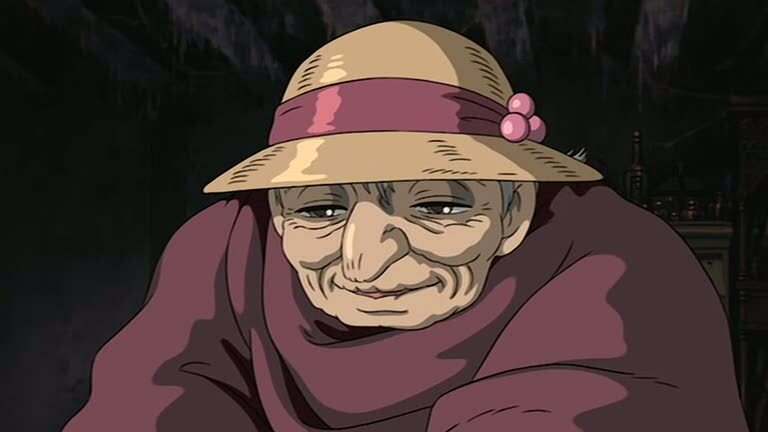 His appearance in turn attracts the attention of the infamous Witch of the Waste (Miwa Akihiro), a large woman in elegant evening dress, who transforms Sophie into an old woman, and curses her with a spell of silence, so that she'll never be able to tell anyone what happened to age her 70 years in the blink of an eye. Sophie leaves the city, looking for a cure, and the further her adventures take her, the more complex the plot becomes. Let us say in brief that she finds Howl's walking castle, run by a fire spirit named Calcifer (Gashûin Tatsuya) and a peculiar little boy named Markl (Kamiki Ryûnosuke), Howl is called to take part in a great war, there's no small amount of intrigue generated by the machinations of the court wizard Madame Suliman (Kato Haruko), and as Sophie falls in love with Howl, and begins to unlock the secrets of his past, she starts to notice that at moments of intense emotion, she "de-ages" temporarily. It's kind of chaotic and confused, though not necessarily confusing. But it's also a bit underdeveloped, and a lot of the film, right smack in the middle, consists of a lot of moving the action from here to here and back, for reasons that are well-explained but still make very little actual sense. Miyazaki's interests clearly lie with the story of Sophie's transformation into an old woman, and the personal growth she is able to experience as a result, and so it is that the character moments inside the castle - mostly confined to a single kitchen-esque room - are typically far more engaging and well-realised than the vastness of the war being waged on the edges of the film. I'd go so far as to say that the film seems to forget about the war subplot at times; though it takes a lot of effort to set it up, it sort of keeps popping up arbitrarily throughout, and is resolved with a most peculiar and not completely dissatisfying deus ex machina. Better by far when it just sticks to Sophie and her new, peculiar little family. As a heroine, she's not so profoundly realised as Chihiro from Spirited Away, but that's a high bar to clear; her much simply character arc is still appealing, and her love story touching - although as is often the case, she's far too interesting and likable to end up with a fellow like Howl, who is represented as vain and brash, heroic but a bit empty-headed, right up until the moment that he's not, for some reason (Howl's redemption, the heart of the movie's narrative, falls completely flat for me by reason of being under-explained, and this is by far the most damning of the film's missteps). The character design is much simpler here than in some of Miyazaki's films, but it gets the job done. Sophie is especially good, particularly as an old woman, when her larger eyes and broader features allow for a wide range of expressions, and the lines on her face give it an appealing texture. Not all of the characters are created equal - in particular, I find in Calcifer something I had never expected to see in a Miyazaki film, an irritating sidekick who just seems to be there for the kids (happily, I've never seen the English dub and have thus been spared having to hear him performed by Billy Crystal [edited to add: actually, it turns out he's not that bad, but "that bad" represented such a chasm that he's still not very good, either]) - but by and large it's hard not to enjoy spending time in their company. That they are well-designed and animated is hardly worth mentioning; it's a Studio Ghibli project. 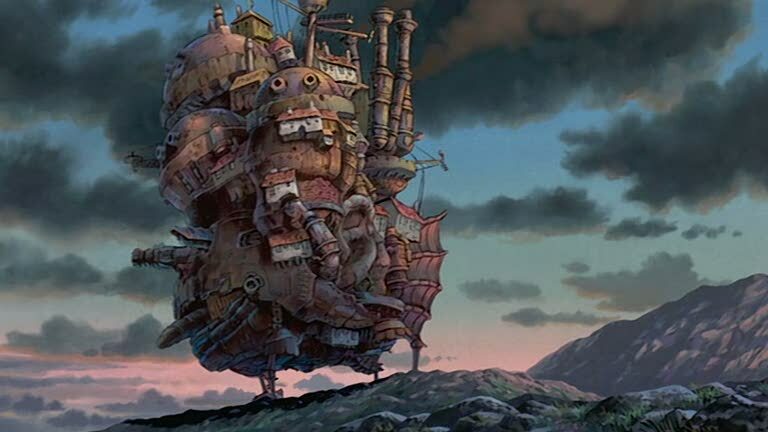 But even that isn't enough to prepare us for how gorgeous Howl's Moving Castle is in spots. I shouldn't hesitate but a moment or two before declaring that it has the loveliest backgrounds in Miyazaki's career. Not to mention, its color scheme is remarkably clean and strong; after the pastels that dominate Spirited Away and the contrasty, limited palette of Princess Mononoke (reds, blues, greens, blacks), the rainbow coloring of Howl's Moving Castle is quite overwhelming and appealing. It is, probably, the most saturated and brightest of Miyazaki's films since Nausicaä. Its visual opulence this serves to at least off-set the saggy narrative: no film that looks this good could possibly be worth ignoring or dismissing. It may, like Kiki, suggest a director who was less than passionate about the story he found himself telling, but you would never be able to argue that Howl's Moving Castle was made with anything less than the myopic attention to craft that makes every one of Miyazaki's features like a jeweled egg, precious and dazzling and so rich that you can hardly believe your good look to stand there looking at it. It was all the more precious upon its release, because for a third time, Miyazaki announced his retirement after its completion. I don't suppose anybody believed him, really, but it would turn out to be (as of this writing), his last dance with CGI, and the possibilities of detail and color that CGI allows. So really, the indescribable lushness that he achieved with Howl's Moving Castle was doomed to be a one-time event. It is not his cutest film nor his prettiest nor his most visually controlled; but it is and is likely to remain his most drop-dead gorgeous.